Before last school year, any student who wanted to attend the Media Center during SLP could write a pass, get their SLP teacher to sign it and then go the Media Center. However, after complaints of the Media Center being overcrowded and unruly, the new Media Center pass policy was established at the beginning of the 2014-2015 school year. Now, in order to get into the Media Center you must have a pass signed by both an academic teacher and an SLP teacher, and a student can only use this pass once a day even if she or he has multiple SLPs. While this policy has good intentions, it has become unfair and ineffective and should change. To begin, the new Media Center pass policy is wasting valuable space. The Media Center is a very large area that is being underutilized. This space should be used for homework and it should be a place in the school where students can have free-flowing conversations with other students. When I went into the Media Center on September 22nd during 6th period, there were approximately 15 students there, most of whom were working on the computers. All the tables that used to be occupied by students doing homework were empty, presumably because of the Media Center passes. This empty space is wasted space, especially given the fact that most SLPs are very crowded. Opening up the Media Center for more students would decrease crowding in SLPs, and would provide students work space to collaborate on academic work. Another problem with the new policy is that teachers give passes out inconsistently. Some teachers never give them out, while others assign them with no questions asked. Many students report that they have been given Media Center passes by teachers who they do not even have, or will get a pass from a teacher for another class. Sophomore Stephen Sharpe said, “I’ve asked for Media Center passes from my teachers multiple times without needing the Media Center and have been given them every time.” Sharpe’s experience is not unique, but this inconsistency is the very heart of the problem with the new policy. Finally, although the new policy attempts to encourage productivity and academic work, it has actually had a negative effect on students’ ability to get work done. There have been many times people have been denied access to the Media Center with a full SLP period that they’ve set aside to finish their projects just because they didn’t have a pass. Senior David Brown has experienced this himself. He said, “ I had three projects at one time and I wasn’t allowed to go to the Media Center because I didn’t have a pass.” When asked if he felt this hurt his grades, he replied, “Yes, I wasn’t able to get anything done during the school day, so I had to cut some corners to be able to pass them in on time.” This rule has indirectly hurt students grades and productivity, which alone counters the production that having a less crowded, quieter Media Center does. Having open admission in the Media Center would help to utilize space, give students the opportunity to collaborate, and encourage students’ productivity. Students should be allowed to stay in the Media Center as long as they are working on an actual assignment. If the Media Center gets too crowded, then students should be allowed in on a first come, first served basis. Students whose productivity relies on Media Center resources could still get passes from academic teachers, but allowing only those students in detracts from overall productivity and ends up hurting students in the long run. 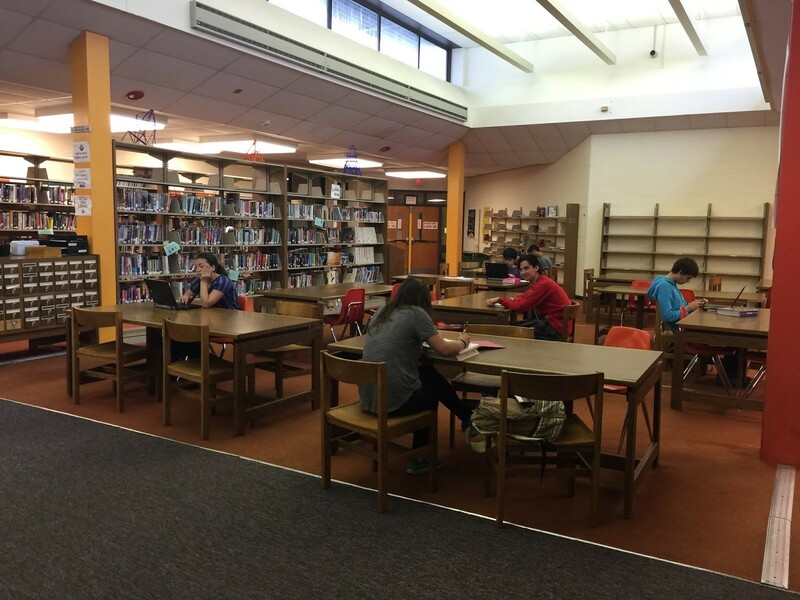 Many students at North Attleboro High School believe that the process for going to the Media Center is unfair and unnecessary. In order to go to the Media Center, students must get a pass from an academic teacher. Without this pass, students are denied access. Though some people are not a fan of this process, many people support it and think it makes the Media Center a better place to work. One supporter of the passes is Media Center librarian, Mrs. McKamy. Whether you agree with the passes or not, they have had a positive effect on the Media Center and made it a better place to get your work done.